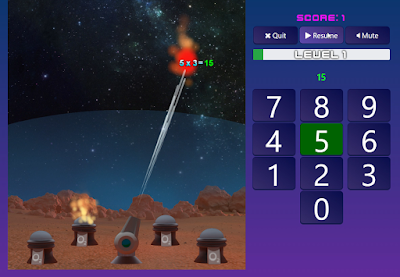 Mars Defense - Our New Focused Math Fact Video Game is now Launched! Logged-in students can play our new game after completing a regular fact session for the day. 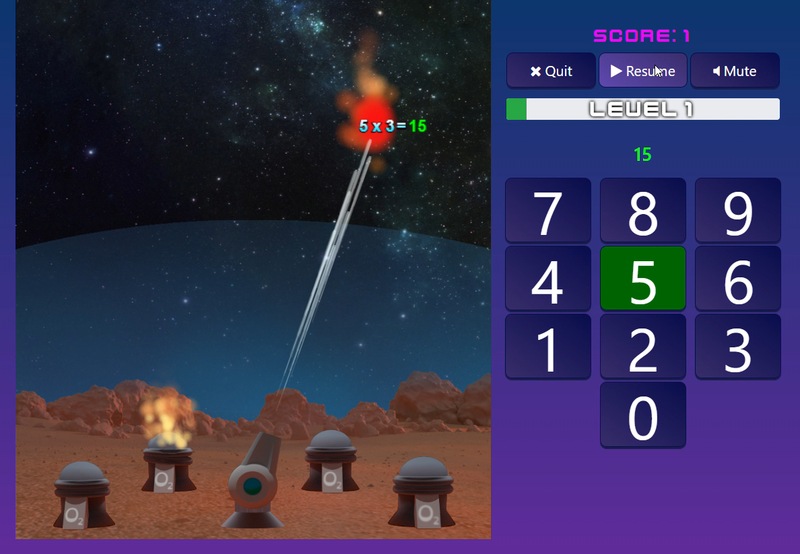 We created Mars Defense to make practicing math facts more fun and more focused, because the best thing we can do to help students is motivate them to practice more. Early testing is showing that all these things are happening! Students who play Mars Defense are less distracted, answering more facts per minute, and are practicing 60% more facts! The original app with the jokes now becomes more of an assessment piece, and Mars Defense uses that information for smart, efficient, and fun practice. We strongly suggest that you not assign more than 50 facts/session in your teacher dashboard, and instead encourage the students to play Mars Defense every day. The practice will be just as effective, but it will be a lot more fun. (And they will most likely practice more, too.) The more students practice, the more they learn the facts they need to work on, so they do well in the game. Then the assessment measures the improvement and moves them on to the next harder facts in the game. High scores tables for the class, the school, and the world provide extra motivation. Once students have completed a regular session for the day, they can log in from anywhere, do 1 fact, click results, and then go to Mars Defense. Practice history in the Teacher’s Dashboard now reflects the total number of facts from both the assessment and Mars Defense. However, the results grid does not reflect Mars Defense practice because the facts are small and move around, so it wouldn’t be a fair test. Also, there are often multiple facts on the screen, so it is impossible to determine which fact was answered wrong (or right). One of the problems with math fact teachers (and math fact game designers) is that we forget what it was like to not know our facts, when we had to work on learning them as a student. To help with this, we created a teacher version, which will practice multiplication up to 16 x 16. It’s a fun way to become a student again and see things through their eyes. Note: this version is not tied into the assessment (jokes) app, so it is not as smart – it doesn’t really know what you know, and it won’t grow with you, but we think you’ll still like it. Teachers received an email with a link on February 1. Soon we will have a link on your teacher dashboard. Of course, you can always create your own fake student and play the regular version. Mars defense does work in Puffin Academy, but the lag is quite noticeable. 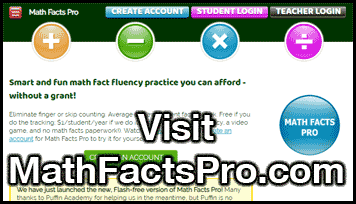 The new game is the first step in improving Math Facts Pro and getting it out of Flash. (Then we will work great on mobile devices.) Once we are out of Flash, we will be adding more games! Also, we have finished making the transition to a faster server on Amazon, so the Meltdown bug fix should no longer be an issue. Thank you for using Math Facts Pro. Stay tuned for updates! You may have noticed some problems with our server recently. All should be working now, except for email. Amazon pushed a fix for a security issue in Intel chips, which led to slower performance, and our server started overloading. 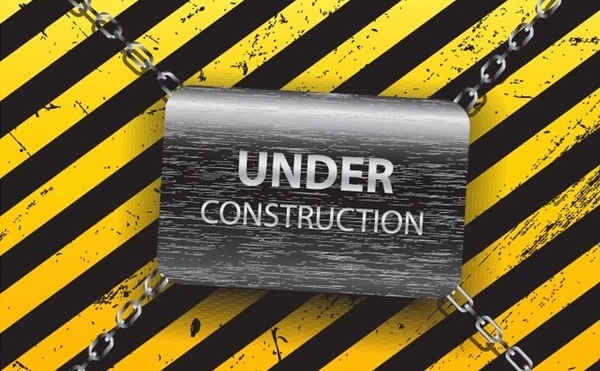 We are in the process of moving to a faster server, which is a plus, but there may be some hiccups, as this wasn't planned. The really good news is that our new math fact focused video game is out! More on that later. Students who are logged-in and who complete a session can play using the new button on their results page. Thank you for your patience. Full speed ahead with upgrades! Better methodology – fact family based, response assessment, fact test, training, and games for practice. Moving the teacher side out of Flash, adding better reporting, and making it easier for district & school administrators and parents to use. Thank you for your patience as we work to roll out these improvements, but know that we will be constantly improving. If you would like to be updated on our progress - when we release games or when we are no longer in Flash, subscribe to this blog in the upper right-hand corner, or follow us on Facebook.